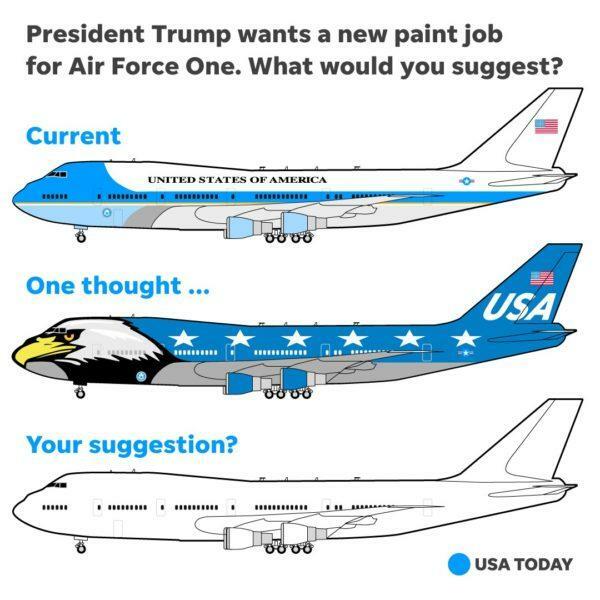 President Donald Trump wants to redesign Air Force One’s signature robin’s-egg blue color scheme (which he describes a “Jackie Kennedy color”) for something that “looks more American,” Axios reported on Thursday, quoting an unidentified source. As we noted in February, President Trump worked out a fantastic deal worth $3.9 billion for a pair of replacement 747s for use as Air Force One with Boeing CEO Dennis Muilenburg. Officials said it represents a $1.4 billion in savings from estimates of over $5 billion for two airplanes and related costs. 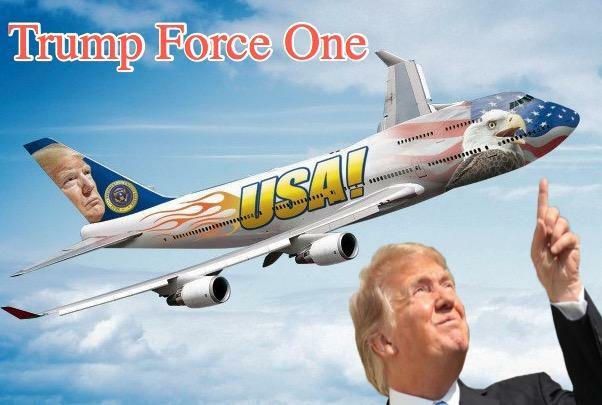 “President Trump has reached an informal deal with Boeing on a fixed price contract for the new Air Force One Program. Thanks to the president’s negotiations, the contract will save the taxpayers more than $1.4 billion,” Deputy Press Secretary Hogan Gidley said earlier this year. Axios learned Thursday that Trump had one specification for the new planes that could undo nearly six decades of tradition: a new paint job believed to be a patriotic color scheme, including red, white, and blue. 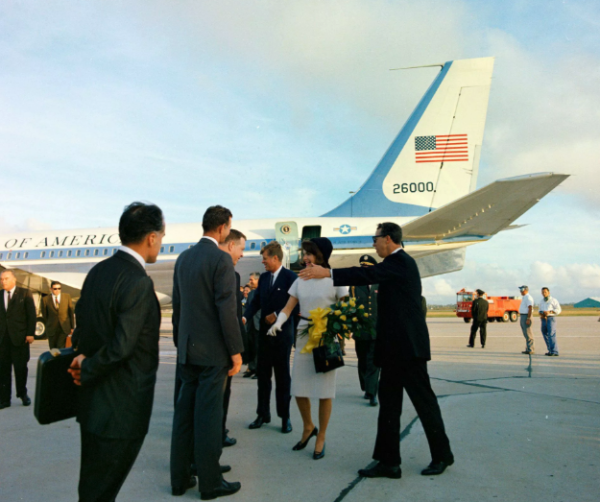 Trump believes Air Force One’s signature robin’s-egg blue color scheme, designed by President John F. Kennedy and First Lady Jackie Kennedy in 1962, needs to “looks more American.” He does not think the current color scheme (technically “luminous ultramarine”) represents America. “Anyone who doubts how strongly Americans feel about the way Air Force One looks should go to the Reagan Library in California and see how many people go there to look at the plane that Ronald Reagan flew on while he was president,” presidential historian Michael Beschloss told Axios. The source told Axios that Trump requested the presidential bed aboard Air Force One to be bigger and more comfortable — “more like the executive livery package on his personal plane than the current, couch-like sleeping configuration aboard Air Force One,” said Axios, quoting the unidentified source. However, there is just one problem: Trump will have to be reelected for him to enjoy the new plane, which the pair of Boeing 747s will not enter service until 2021. How did Twitter respond to the news of a new Air Force One color scheme? CNN contributor freaks out about the redesign. Someone is surprised that Air Force One is not painted gold — reflecting Trump Tower. I'm surprised Trump doesn't want Air Force One hosed down with gold spray paint. Make it look like the inside of Trump Tower. An alleged painter of military aircraft has offered his services to paint the 747s.